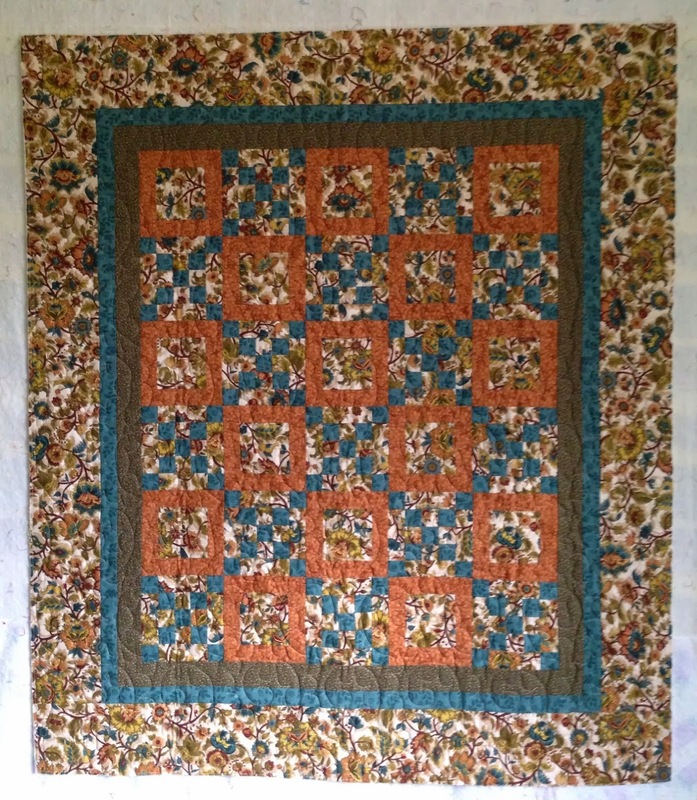 At the beginning of November, I posted that I would participate in A Lovely Year of Finishes for the month of November and I would finish a quilt started almost four years ago. 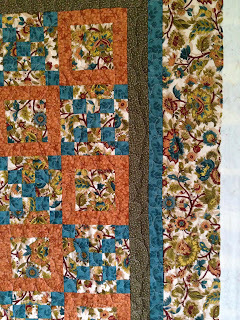 To date, I have finished sewing the squares, assembled the quilt, added borders and quilted it. All that remains to be done is to bind the quilt. I will add piping to the binding -- I think in the blue color -- and then the binding will be in the same fabric as the final border. Yep, I will finish it in November!! Even though it is already November, I have decided to join the fun. My first project to finish this month dates back to April 2010. 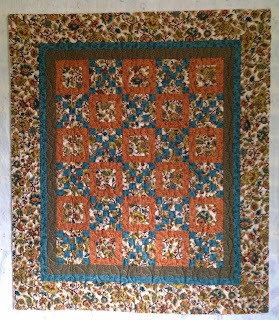 I went to AQS in Paducah that year, and I took a class to make a mystery quilt. It was billed as having an afternoon of fun and creating a memory of Paducah. Sewing machines were provided. Fabric kits were also provided, with the fabric already cut to size. All that was needed was to sew the pieces together. I figured it would be a good way to create something to remind me of my first trip to Paducah. Are you surprised it's not finished? Well, I can be a bit picky in my quilt construction. I like my 2-1/2" squares to be 2-1/2" square. Alas, not all the pieces were cut to size accurately. And then I was supposed to piece a border using strips cut cross grain? I prefer to cut my borders on the straight of grain, if at all possible. There is less stretch in the straight-of-grain pieces, and squaring up the finished project is easier. During the afternoon, I did sew pieces together, but I was underwhelmed, so I was probably the least productive person in class. First thing I did when I came home was to try to find additional material, particularly the border fabric, which I really liked. I discovered the fabric was a few years old and could not find any additional fabric for sale. What was I to do? I finally decided I could reduce the size of each piece and have a smaller version of the original quilt. 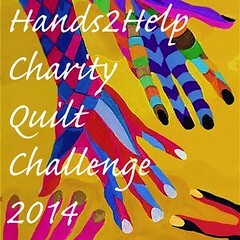 So instead of a 60" x 70" quilt, I will have a quilt approximately 30" x 35". 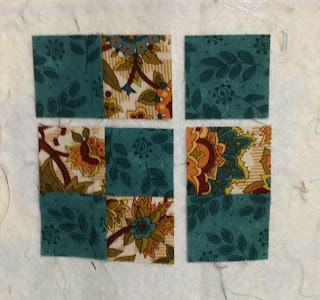 If you start with a nine-patch made out of 2-1/2" squares, you can cut it down to make a new nine-patch out of 1-1/2" squares. By carefully cutting, you end up with something like this that you have to then sew back together. At this point, I've done all the cutting. 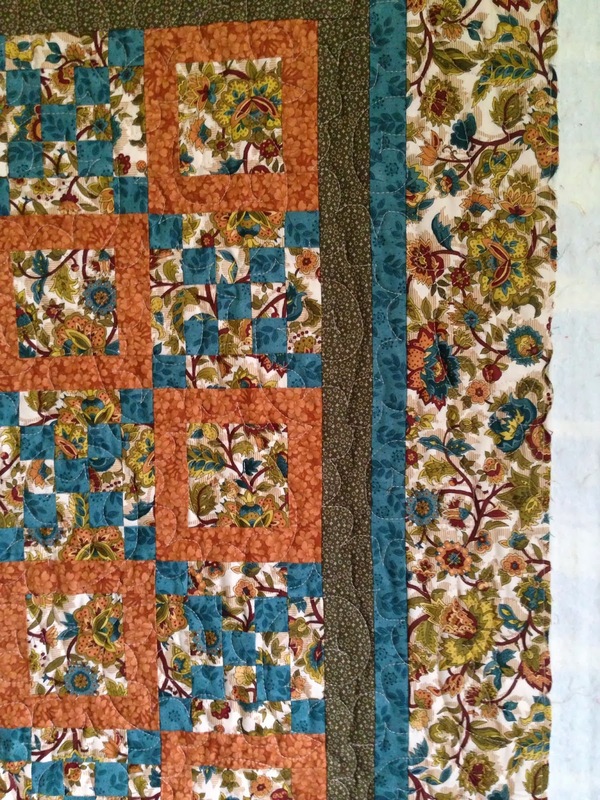 I just need to re-sew the blocks and assemble the quilt. I will finish it in November 2013!